It was February 26th but in this camper the day was only referred to as the Carling Cup Final Day! The morning was spent with Hedd driving us to Sale along Highway 1, after leaving a very hot Melbourne, anxious to book us into any type of accommodation with Foxtel Sports so he could watch his team, Liverpool, play Cardiff in the Final. We ended up in the Best Western Motor Lodge, the one and only establishment with the aforementioned TV channel. After checking into our room and double checking once more that it indeed had Foxtel Sports, Hedd relaxed enough to enjoy a bit of exploring. 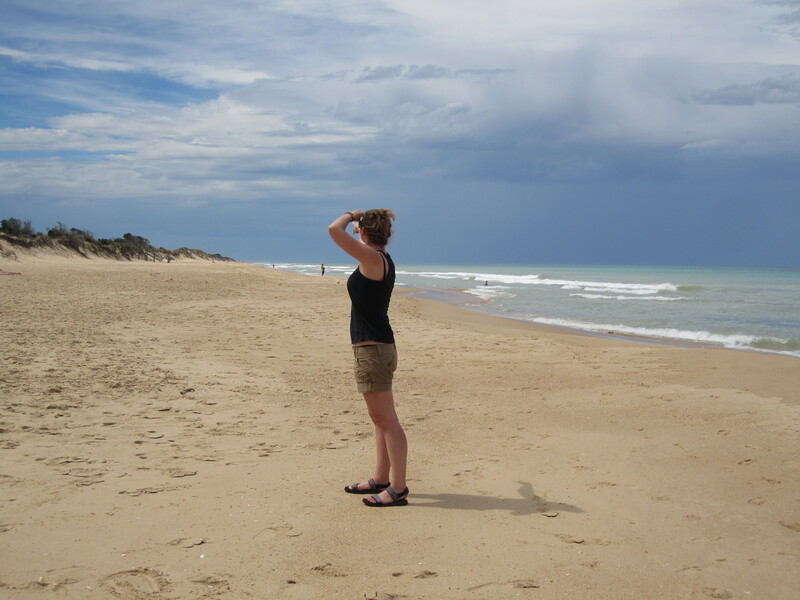 We made our way to the coastal village of Seaspray and then drove the Ninety Mile Beach to Golden Beach. The ninety mile sweeping beach in the shape of a shallow smile was really cool to see and had sand dunes all along it with golden fine sand. And it was sunny so we could actually see, walk along and enjoy this Ninety Mile Beach not like when we were in North Island New Zealand battling against the rain and mist to see Northland’s own Ninety Mile Beach! 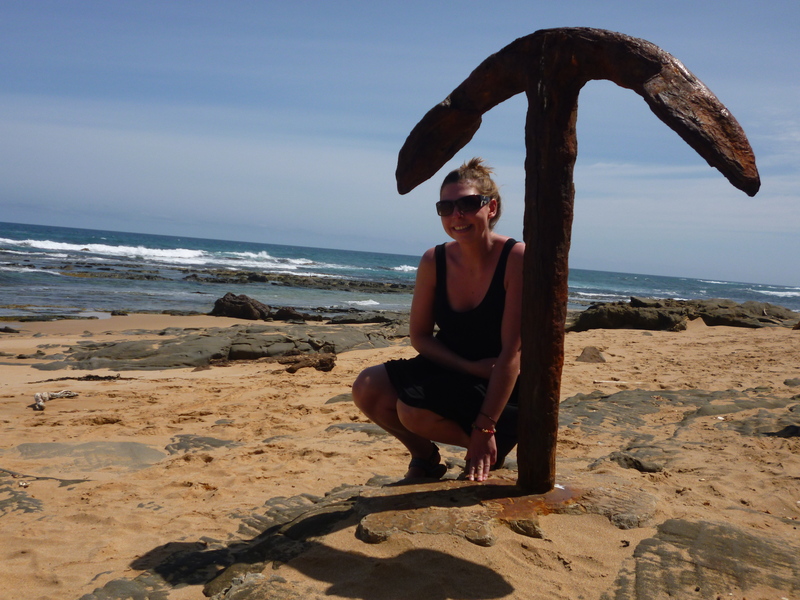 After paddling in the sea and having a chill out on the beach we made our way back to Sale. Touch and go whether we would make it as the fuel gauge was on empty for a considerable length of time, we were relieved to reach the edge of the town and dive into the nearest petrol station. Take out pizza for tea whilst watching a movie and ticking down the time to the match. As the alarm sounded at 2.15am for Hedd to take his position in front of the telly to watch Liverpool v Cardiff football game. My original intentions of joining him on the sofa was soon forgotten and I stayed in bed and dozed in and out of sleep with Hedd’s cries of delight and sorrow as Liverpool struggled through full-time, extra time and penalties to eventually win at 6 o’clock in the morning! Oh dear, got to love time difference! out into the road which I had no choice but to run over. I screamed a lot; this lizard was easily 1 meter long and felt like I was going over a speed bump! 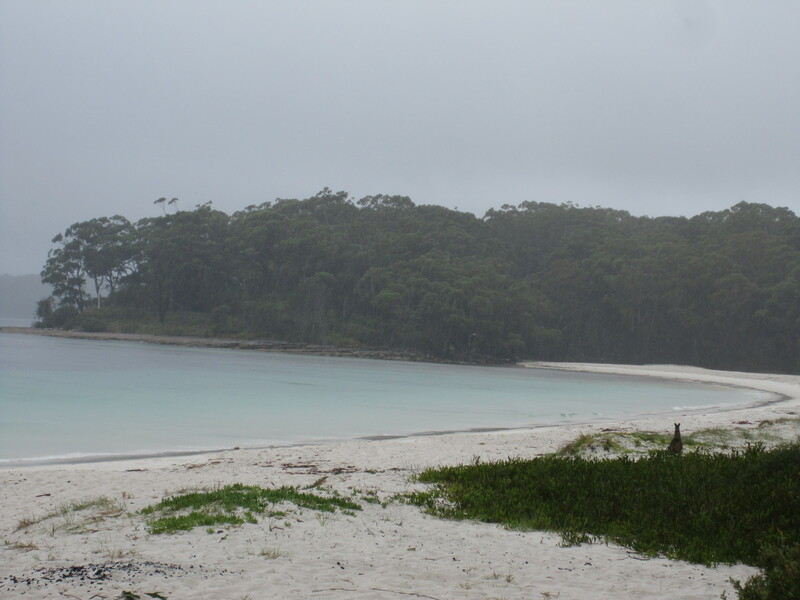 We arrived at Cape Conran in a break in the rain and I must say I was pleased to get out of the car. The camper wasn’t damaged but Hedd said he could see lizard guts as he looked under the vehicle; squeamish and irrationally thinking all lizards were now out to get me, I ran away from the camper and onto the sheltered, white sand beach of Cape Conran. It was very pretty and we paddled our feet until we began to feel the rain again. Back in the camper and driving north again to our overnight stop at a town called Eden. However it wasn’t the paradise the name suggests as we creeped into town in the torrential rain and mist which made the 5pm look more like night-time! We found a holiday park next to Eden Beach, parked up, cooked soup for dinner and rooted ourselves on a covered picnic bench with a pack of cards and a bottle of wine to see the rainy evening in the best we could. We fell asleep that night to the sound of rain on the camper roof. Oh Australia, where did your infamous sunshine go?! Tuesday 28th Feb and a bout of bad luck struck Hedd. He started the day gently rolling into the car behind him as we left Eden (the gentleman was not bothered at all and was more annoyed that Hedd made him wind his window down whilst it was tipping it down to see if he was okay! ); next up was a big rock flying up and hitting the windscreen creating a big chip; and finally as we stopped for lunch at Batesmans Bay for lunch the crockery box fell out of the camper as he opened the side door smashing our 2 glass cups! Needless to say Hedd was not a happy chappy! Still raining we got back on the road and headed towards Jervis Bay and the Booderee National Park- our stop for the night. We stayed in the National Park campsite called Green Patch- pretty basic but fine for just 1 night. We reluctantly left the camper and legged it over to the covered BBQ’s to make dinner- Chorizo sausage salad. Then legged it back to the camper where we hid from the heavy rain until, again reluctantly, we had to get out to brush our teeth before bed. Happy Leap Year Day! Guess what, it was still raining! We worked out it hadn’t stopped since lunchtime on the 27th and by now our rain coats were drenched and we were both fed up of being constantly damp and not being able to do or see anything. 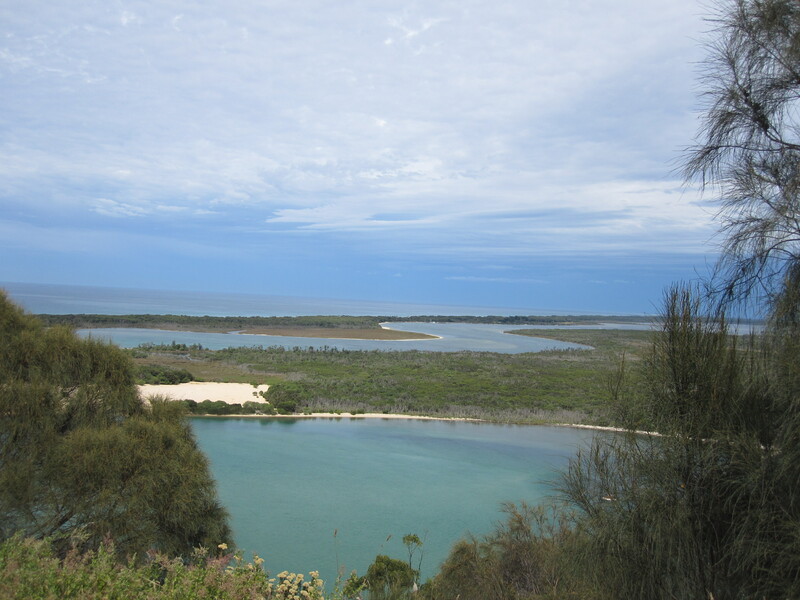 These feelings were heightened especially in Booderee National Park as in the sunshine we could see that the place would be stunning, fantastic white sandy beaches, fun forest walks and cool historic sites to visit. We were determined to see/do something here. So we drove down to Green Patch Beach, where indeed the sand was white and the waters clear. Then we drove to the Cape St George Lighthouse ruins. Putting our soggy coats on, we braved the weather and walked up to it reading the info boards and visiting all the different lookouts. The weather now was truly atrocious- cold as well as wet instead of just being wet. But the lighthouse ruins and its history were quite interesting. The lighthouse had never served its purpose well, being designed all wrong and being in the wrong location; it became a showpiece. However each of the families that lived in it had tragic accidents so it was thought to be a highly unlucky (some may say cursed) place. People drowning in fishing nets, falling off cliffs, catching diseases, getting shot…all sorts of horrendous endings! Reading all about that plus the inclement weather soon saw us leave the place sharpish and driving out of the National Park and up the coast to Wollongong- our last stop on Highway 1 before heading west into the Blue Mountains. Having lunch and stocking up on maps and information on the Blue Mountains from Wollongong information centre, we set off for Katoomba- Blue Mountains main town. Passing familiar place names on our way, we drove through Penrith and Liverpool, before arriving in Katoomba at 5pm in the thick mist and rain. My goodness, the place really did look miserable! As we drove into Katoomba Falls Caravan Park- the only one in town and within a 1 hour radius- we couldn’t believe our eyes when we read the sign saying ‘No Vacancies’! Hedd went into the office anyway and looking so depressed the lady took pity on us and moved a load of bookings around so she could give us a pitch for the 2 nights we needed. Phew, thank goodness for that! We had pitch 13- unlucky for some but at that point in time, for us, our saviour! Nothing else to do but to make dinner, we headed over to the camp kitchen only to be greeted by a big group of 50-year-old + couples who slightly drunk offered us cheese, biscuits and dip. They were all from Newcastle, north of Sydney, here for a golfing holiday. But on account of the rain had done little golfing and a lot of drinking instead! As we proceeded in making our beans on toast the group took great interest in us and were given the title “the young people”. “Give the young people more dip and biscuits”, “give the young people some chairs”. And after our beans on toast one of the wives came over with 2 Aussie Patties (burgers) full with salad, cheese and sauce for us saying “she couldn’t see us going to bed with only beans on toast in our bellies” . Although pleasantly full after our beans on toast we weren’t ones to pass up on free food and enjoyed our burgers tremendously whilst chatting away with the group. Before they could feed us with more food, we retired to the van. For a while I refused to get out of the van on account of the foul weather, cleaning my teeth my putting my head out of the window. But eventually nature called and I legged it to the loo and back. Even though the amenities block was less than 20 meters away, I still managing to get absolutely drenched. I went to sleep hoping, wishing and praying that tomorrow we wouldn’t wake up to rain drops. Naturally waking up at 7am, the first thing I notice was the silence…halleluiah it wasn’t raining! We both looked at each other and without speaking raced to get dressed to head out and actually do some sightseeing. 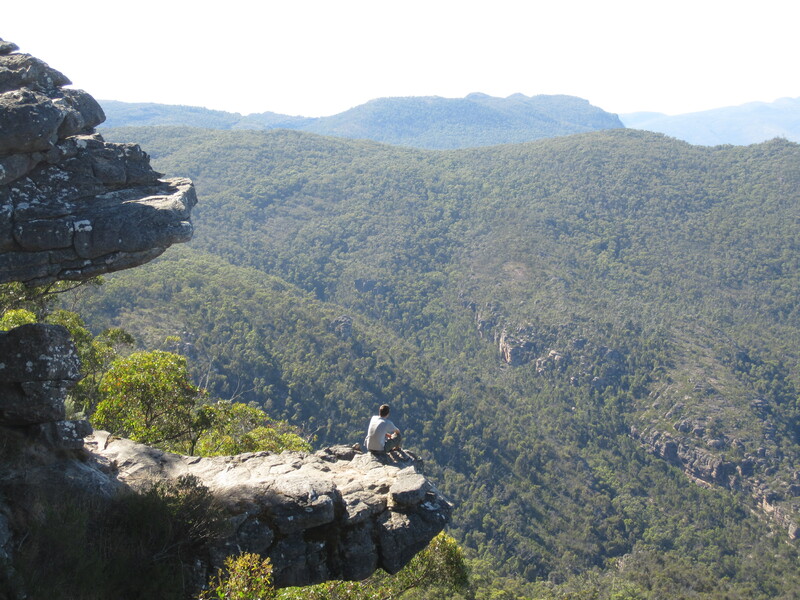 We were walking out of our campsite and towards Katoomba Falls by 7.30am, picking up the Prince Henry Cliff Trail which wraps itself along the mountain side with views of the Blue Mountains and the valley below culminating at the 3 Sisters rock formation at Echo Point. We were so excited to be outside doing something we almost skipped along the trail. But we soon came to an obstacle- “Path closed due to recent bush fire activity”. We weighed up our options- turn back and go along the boring road with no views or push back the very flimsy gate, think blow it and proceed. 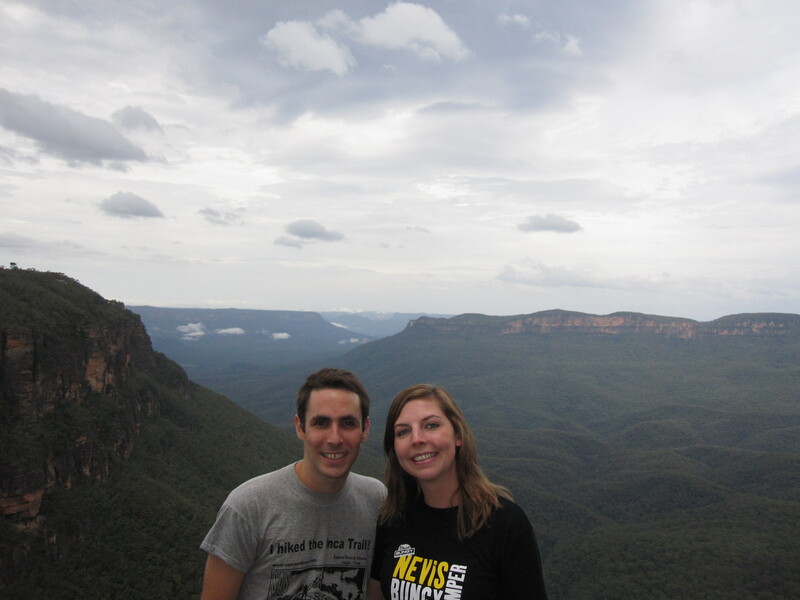 We went with the later option and continued to enjoyed the spectacular view as we made our way to Echo Point. We were going along quite happily when we turned a corner and faced our “ah, this is what they were talking about” moment. A whole staircase of wood obliterated into charcoal! We clambered along and quickened up the pace in the fear of getting caught! Eventually we came to Queen Elizabeth Lookout and bent around the sister “closed path sign” and we were back on the path of legitimate walking! 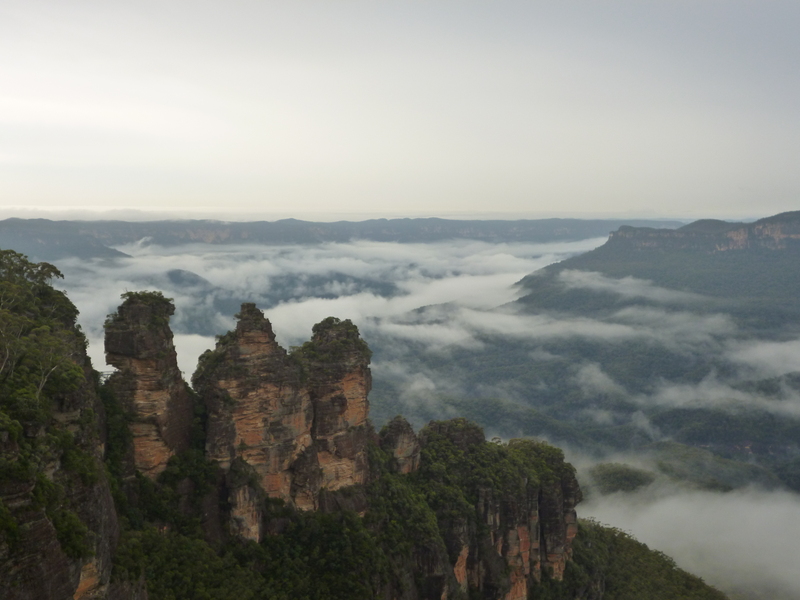 As we approached Echo Point we got our first sight of the rock formation called the 3 Sisters. Hedd was so chuft if was seeing them as he had convinced himself he would be confined to the camper until we got to Sydney. I had again some deja vu moments as I stood taking very similar photographs to the ones I took back in 2004 but I still took them! So the legend of the 3 Sisters goes that 3 beautiful sisters from the Gundungurra people were in love with 3 brothers from the neighbouring nation of Dhuarruk people, but marriage was forbidden by tribal law. The brothers were warriors and decided to take the maidens by force. Tribal war forced the Kuradjuri (clever man) of the Gundungurra people to turn the sisters into stone. He intended to restore them after the danger had passed but he was unfortunately killed in the battle and to this day nobody has been able to break the spell and turn the 3 sisters back to their natural form. Hmmm not such a clever plan after all! We then walked further along the track and down part of the Giant Staircase until we hit another ‘danger do not pass’ sign. 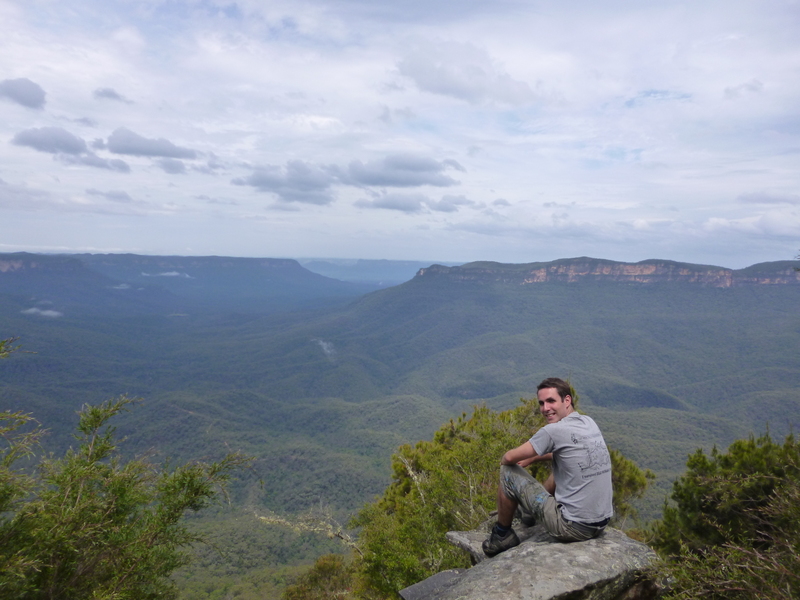 We decided not to push our luck and turned back towards our camp site really pleased we’d had the break in weather to see the key sights in the Blue Mountains. 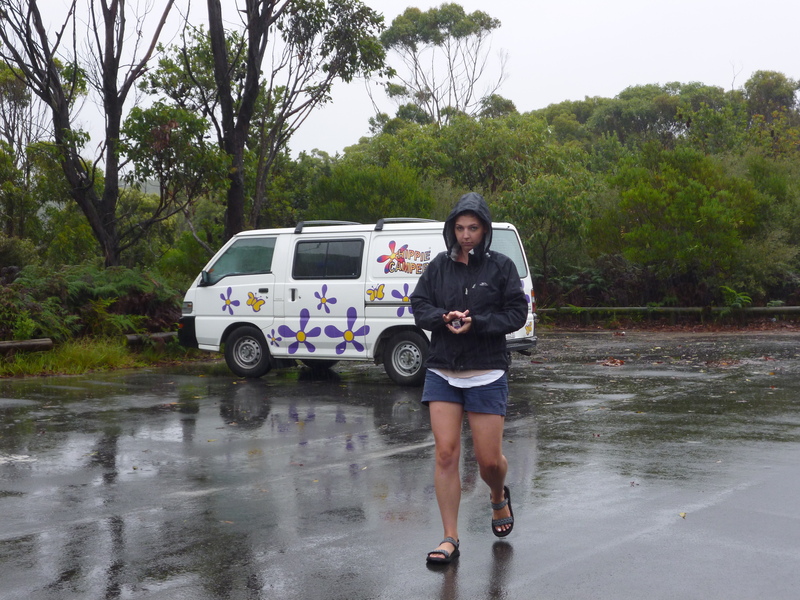 After a well deserved breakfast and showers we headed out again but this time in our camper to drive Cliff Drive, culminating at Sublime Point, and stopping off at all the various lookouts on the way. As we checked out Honeymoon lookout, Kiah lookout, Leura Falls, Gordon Falls lookout and eventually getting to Sublime Point lookout we had seen the Blue Mountains in the now clear, cloud free weather from many different perspectives and, as the sun started to shine, saw why they were called ‘Blue’ Mountains. A blue haze appeared before our eyes in the valley as the sun hit the oily atmosphere created by the eucalyptus trees, gets scattered with only the blue being absorbed by the canopy giving its blue appearance. An optical phenomenon called ‘Rayleigh Scattering’. As we made the walk back to our camper from Sublime Point Lookout the spits of rain began once again and we smiled at our timing. Arriving back at the campsite we resume our hermit lifestyle as the rain lashed down on us once more. We were just pleased we had got our morning of sightseeing and whiled away the afternoon playing cards and listening to music. As it was St Davids Day we celebrated with a dinner of Lamb Burgers! Weather= Cold, wet and miserable! Drink= Wine and plenty of it! Shouldn’t have done it but pleased we did moment= Walking along the closed, due to forest fire, Prince Henry Cliff Walk in Katoomba! Rain, rain, rain…the heaviest rain in that region in 12 years! Great, well we could at least be grateful for two things. Firstly we were mainly traveling via the coast and were not in the areas effected worst by the flooding. Secondly, we were traveling in a camper van, and camper vans are so much better than a tent in the rain! Despite the rain, we still managed to have a great time and saw some cool things. Sometime you just have to make the most of a bad situation, which we certainly did. We went to all the places we were going to and although I’m sure that Jervis Bay and the Blue Mountains would have been so much more spectacular in the sun, we got to see them. 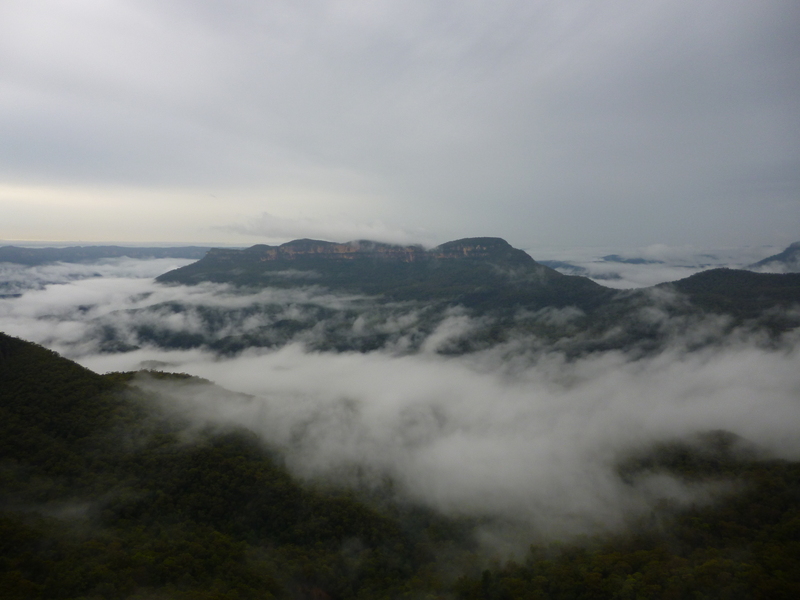 We were even lucky enough to get 4 hours of no rain and no fog in the Blue Mountains, so glad we got up straight away and just went out to see what we could do. So there’s the lesson, when the weather is good make the most of it, and when it’s not make the most of that too!! Camper van’ning- a whole heap of fun! First things first, let me introduce you to our Camper. 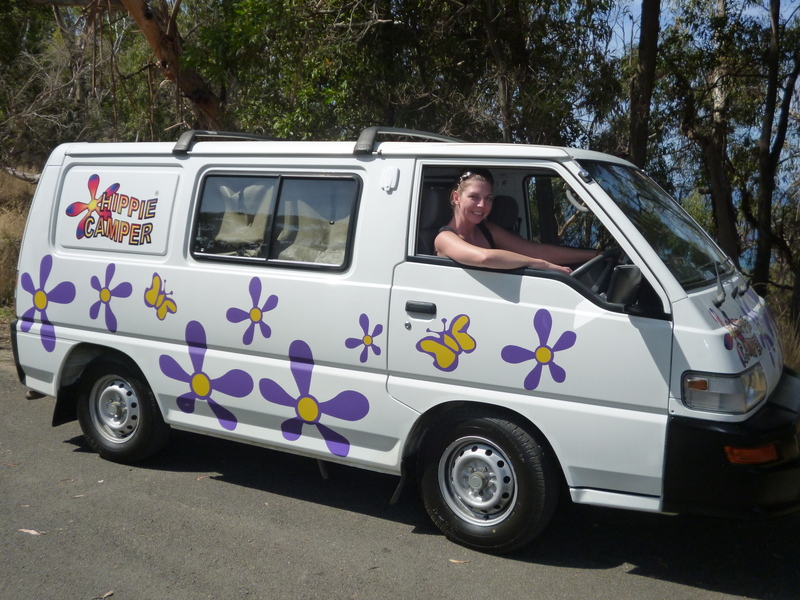 Decorated in butterflies and flowers, she’s on the Hippie side of the spectrum but deep down it’s a Mitsubishi Express 7300- white van man van- kitted out with a fridge and wash basin in the boot and a bed in the back seats. Basic, budget option but it had absolutely everything we needed and we were super excited when we finally got our keys (the staff at Melbourne Hippie Campers are not the quickest!) and drove off to start our Aussie road trip. After filling our fridge with food supplies (and of course cider!) from a nearby Woolies supermarket, we were off on the M1 motorway heading towards Torquay and the start of the Great Ocean Road. 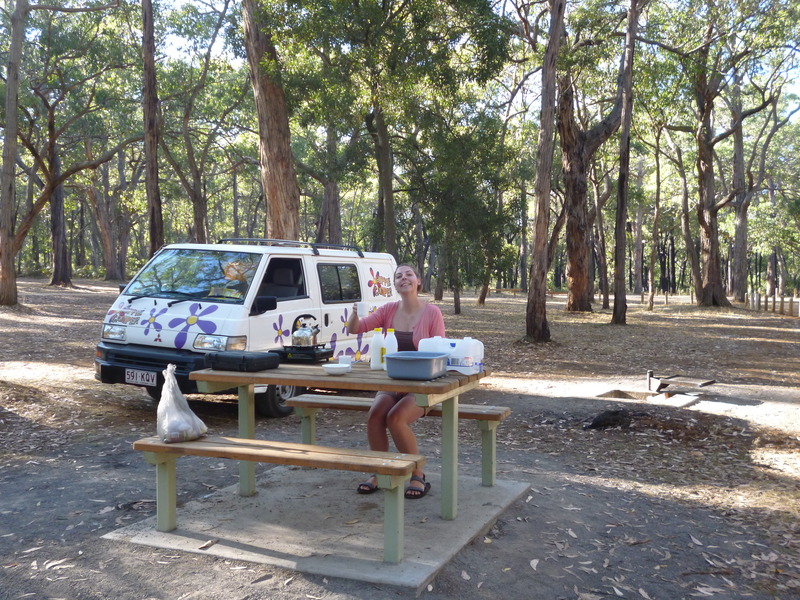 The people who had hired our van previously had left us a fantastic book, ‘Budget Camps and Stops Australia’ by Paul Smedley, in the glove box and we used it to find Torquay Park Area where we pulled up to cook our dinner that night. Cooked by Hedd on our gas stove we had Kangaroo steak salad and we ate it on a picnic bench in the open air and sunshine overlooking Torquay Beach and the kite surfers occupying the Bay. Not a bad first dinner! Now hiring a camper van is not the cheapest so we had the intention of freedom camping as much as we could to balance out our budget. However ‘Surf Coast Shire’ (the most ridiculous name for a Council) had other ideas for us with signs up everywhere saying ‘no camping or sleeping in vehicles’. 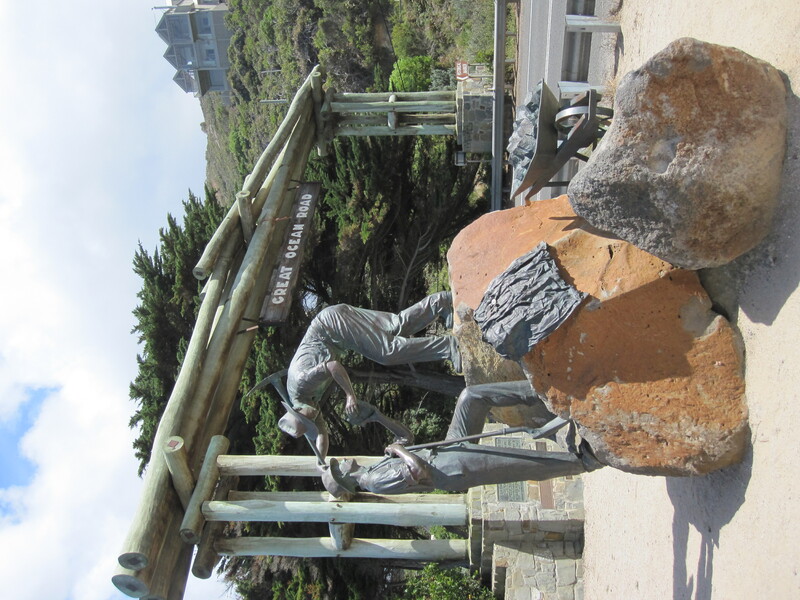 So after checking out Bells Beach and Point Addis lookouts we reverted to Plan B and got our holiday parks in Victoria book out to find a cheap campsite. Airley’s Inlet Holiday Park was the new target and we set off in earnest as it was getting dark. On the way we saw our first Kangaroo. It was just by the side of the road and it was massive! No cute little Skippy; this one could have done you serious damage. Needless to say we didn’t get to close to it! We arrived at the campsite at 8.30pm to a very closed reception. However the owner Arys who was watching our disappointment on CCTV took pity on us and came down to reception and book us into a powered site for the night ($22.50). Relieved at our good fortune, we cracked open a cider and sat inside our camper toasting the first night in our new home. Making the most of the camp kitchen we had fried egg on toast for breakfast, made the compulsory cheese and relish sarnies for later and checked out before 10am. We drove to the Lands End Lookout a couple of minutes away and then walked along the coast to Split Point Lighthouse. 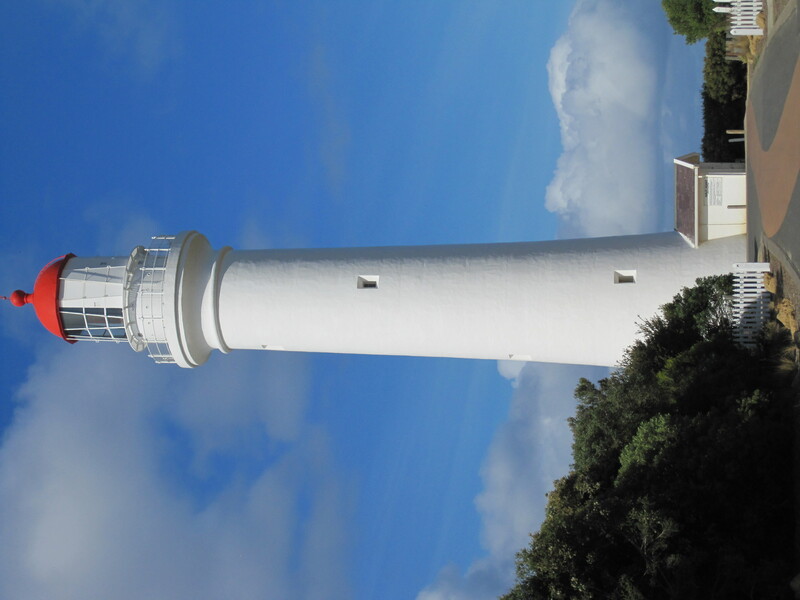 Fondly known as the White Lady, the lighthouse was built in 1891 and is 34 meters tall. But most importantly it is the lighthouse in the TV show ‘Round the Twist’ and we sang the theme tune an embarrassing amount as we walked towards it! The lighthouse was pretty cool and as we wandered around it we really wished we had a laptop so we could watch an episode of ‘Round the Twist’ for old times sake. But alas no laptop and we walked back to the camper via Step Beach where our attempt at a jog for ‘exercise’ turned into a mess around dodging waves…running on sand is hard! We double backed on ourselves driving back to Anglesea to visit the golf course there which is also home to a big family of Kangaroo’s. However we saw none and we were soon heading back towards Airleys Inlet and onwards to pioneer more of the GOR. Heading towards a town called Lorne we passed under the Great Ocean Road Arch which is the largest enduring WWI memorial in the world. You see 3,000 Australian returned soldiers and sailors had built the road and the wooden arch crossing the road commemorates the construction of the road and the sacrifice made by so many in the First World War. It was a nice thing to stop at. We arrived in Lorne at lunch time and we grabbed a couple of cold drinks and took our camp chairs and sandwiches down to the beach to have lunch. We chilled there for an hour or 2 reading and watching the waves before continuing the journey turning 10km inland from the GOR to check out Erskine Falls. It was a pretty 30 meter drop waterfall but the steps going back up to the car park were a killer. The walk was shaded which was a bonus but it was still baking! 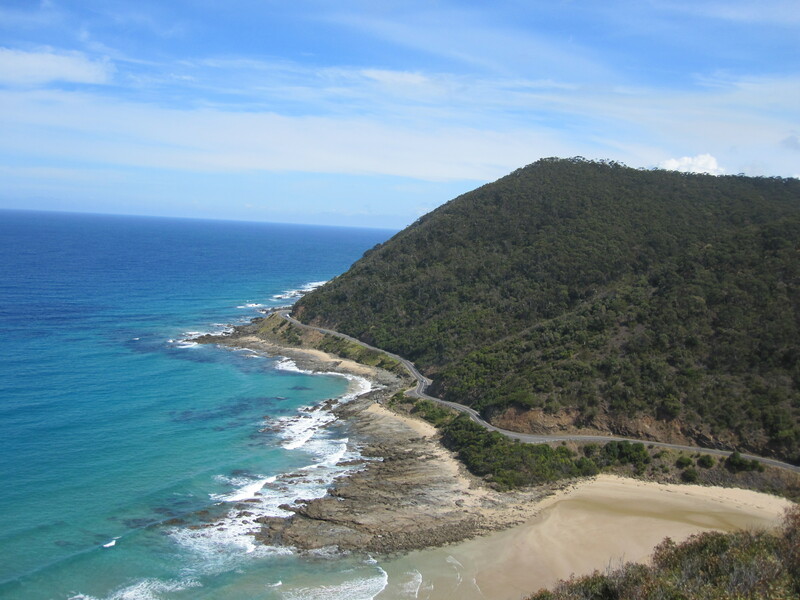 On our way back to Lorne we stopped off to check out Teddy’s Lookout and the fab view it offers of the GOR as it winds and tracks itself mountain one side and the sea on the other. It’s why the GOR is one of the best drives you can do in the world! We then headed to Kennett River, parked up and then walked up Grey River Road which is a well-known hot spot for Koala spotting. The walk is through Manna Gum Forest- the Koala’s preferred diet- and as we searched the high trees for signs of movement our attention was diverted by amazing bird life. Kookaburra’s (which actually look really evil in real life) and these amazing little parrot like birds called Crimson Rosella’s. We saw a few Koala’s early on in the high trees but they were all curled up sleeping so we couldn’t get a good picture. But Hedd was on a mission and we walked over 30 minutes up hill before we decided to call it quits. But as we were walking down hill our eye level was more inline with the Koala hang outs and we saw loads more and these ones were much more active. Very cool! It was then back in our camper towards our stay for that night in a free (and legal!) campground past Apollo Bay down Horden Vale Road. 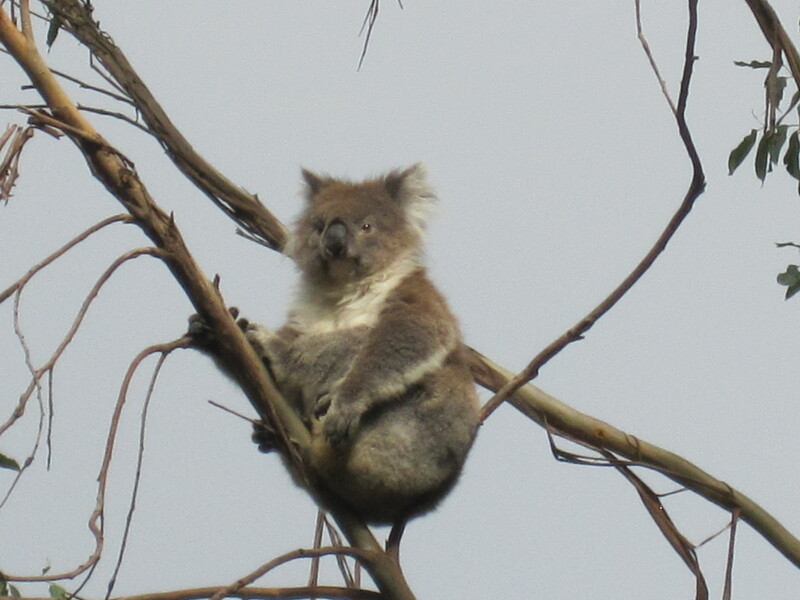 But on the way on a branch overhanging the road we saw the most awesome Koala. We pulled up and spent some time with him. He was really big and so close up and was being really active. In fact as we turned to leave the little creature got even more active like he didn’t want us to go! I think he must just like the attention! After taking what seemed like hundreds of photo’s of the Koala we decided we probably captured him pretty well and headed off to our campground. So our freebie campground- a field next to a lake with long drop toilets. Nothing fancy but with plenty of trees for us to park our camper in a shady spot which was good. Only thing was that it was down a long unsealed road that seemed to go on forever but perserver…there is a campsite down there eventually! Tea that night was meat balls and salad which we ate on a slightly dubious camp table with a broken lid and leg! But we managed all the same, washed up with cold water from our sink and headed to bed hoping to wake up with kangaroo’s all around the camper the next morning. through bus loads of people to get down the steps to Gipson beach to check out what all the fuss was about. Just a big rock really a little way out to sea, but the late afternoon sun hitting it brought out its brilliant colours- orange, yellows and creams. Then, just a little way up coast, we arrived at the 12 Apostles. Again a collection of limestone rocks just out to sea. There were never ever 12 of them and there are even less now that many have fallen victim to wind and wave erosion. Much like Gipson Steps the place was packed with day trippers but the Apostles are still a cool sight to see, if perhaps a little ‘bigged up’ by the GOR tourism board. We found a lovely campsite back at Princetown to stay the night- Apostles Holiday Park- pitched up, showered and made tea before heading back to the 12 Apostles for sun set- the best time to view the Apostles. There were still plenty of people there but not the crowds from earlier and secured a spot overlooking the beach to watch the sun go down. Unfortunately it was cloudy so we didn’t see the traditional big orange ball pour itself into the sea on the horizon which was a shame, but instead as it did the sun tinged all the clouds in the sky red. So all around us the sky was touched with crimson, it was really rather beautiful. Then as it got darker 4 little penguins arrived back from their day at sea and wibble wobbled their way up the beach to their nest. You normally see a lot more but it was malting season so penguins stay up to 2 weeks out at sea without coming back. So after watching these 4 guys for a while and being sure that this was our lot for the night we headed back to our campsite to sleep. Woke up today with my right ankle twice its normal size, 4 large bites circling my ankle bone- ouch! After some breakfast, some anti histamine pills and a struggle to get my sandles on, we were off and headed for Loch Ard Gorge. Loch Ard Gorge is a series of limestone caves, bays and arches and also the site that the Loch Ard ship sank in 1878 hence its name. It was already getting warm as we walked to the various look out points and down the steps to the beach. 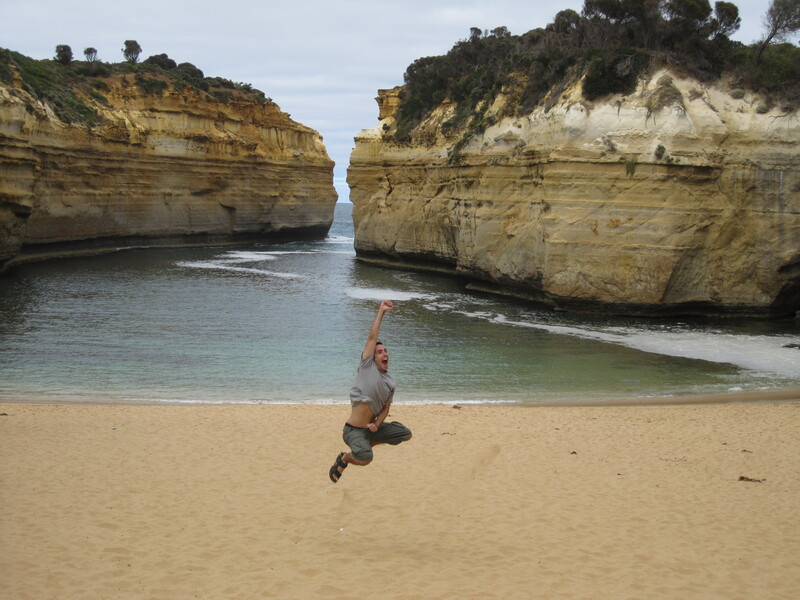 With its easy access and limestone archways I found Loch Ard Gorge almost more impressive than the 12 Apostles. But maybe that was just me! Don’t shoot me GOR Tourist Board! We then drove to Muttonbird Island lookout and wandered through Loch Ard Cemetery which have memorials of those who lost their lives in the wreck. Thunder Cave was next where the sea crashes into and up the cave creating a lot of white water and thunderous noise. That was pretty cool. 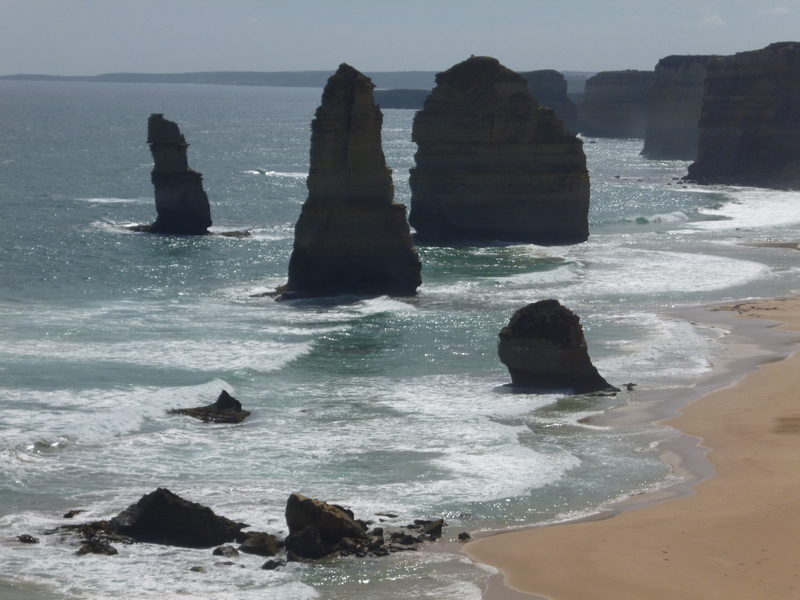 It was now super hot and you could really feel the lack of o-zone; we were relieved to get back in the van and have the breeze in our faces as we drove along our last stretch of GOR towards Warrnambool, stopping off at our last limestone formation called London Bridge. Now just a rock stump out to sea, the main arch connecting London Bridge to the mainland fell into the sea in 1990 marooning 2 tourists on the newly formed island! They were rescued soon after by helicopter but that would have been one hell of a holiday story to tell the folks at home! Just before hitting Warrnambool we stopped off to visit ‘Cheeseworld’ in Allansford where Hedd fed his mild addiction to cheese with a cheese taste and some lunch. And then we were in Warrnambool- a rather hefty town that marks the end of the GOR. Saying goodbye to the GOR we made our final drive of the day to a free (and legal!) campground, called Saw Pit, in Narrawong. 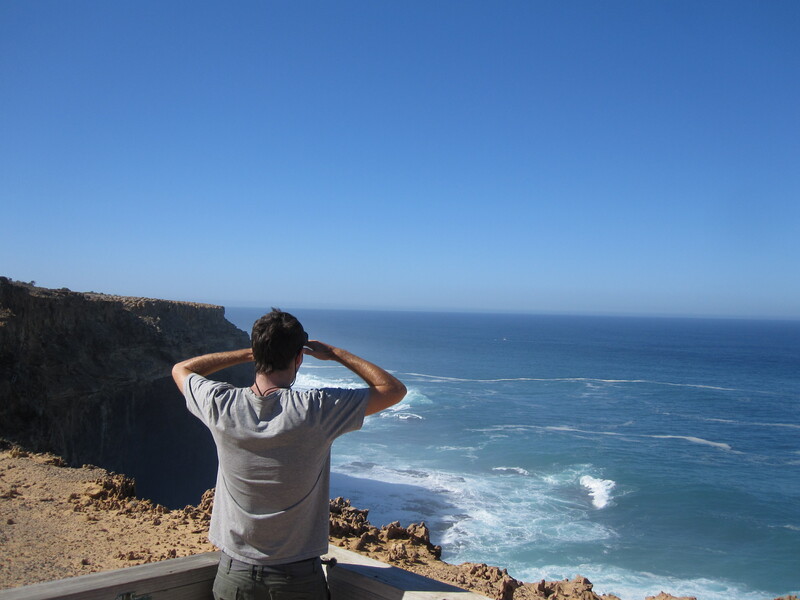 1/2 a tablet of Hedd’s 9 x strength anti histamines later and an ankle still the size of an elephants, we made our way further West to Cape Bridgewater in a hope to spot a blue whale. Today was a scorcher and as we parked up at Blowhole car park there was not a cloud in the sky. But alas no whales either, but we did walk to a petrified forest which was quite cool. Then it was time to leave the coast and head north on the A200 towards the Grampians- Victoria’s rather attractive mountain range. And my goodness did we notice the change in temperature- the heat got increasingly unbearable as we got further and further inland and the winds hurtling across the plains into the camper were boiling too; we could get no relief. Eventually we sacrificed the fuel and put the air con on. Phew, did we need it! 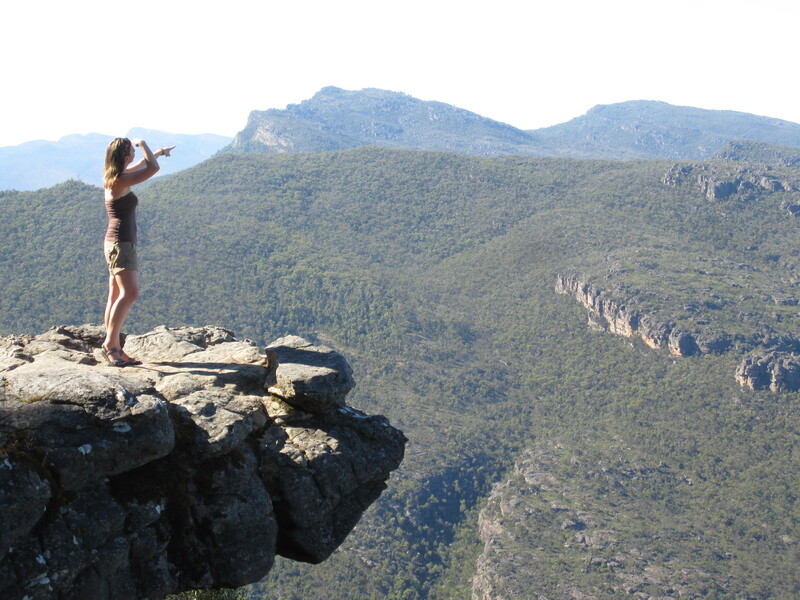 We had lunch at a rest stop called The Griffin as an ode to the local pub in Ruthin where we had leaving drinks, and then made our way up Mt William- the highest peak in the Grampians. You can walk the 2k to the summit but we didn’t get that far it was just too hot! We arrived into Halls Gap, the Grampians main town, early afternoon and paid the information centre a visit to find out what we could do in the area in this heat. They confirmed that it was indeed in the upper 30 degrees and was gonna get into the 40’s over the next few days! Crazy hot! If we wanted to do any walks it would have to be in the early morning with plenty of water. Armed with that info we tried to be as active in the heat as possible, visiting the Brambuk Cultural Centre to learn more about the Aborigine heritage before succumbing to the inevitable and collapsing in the shade with a cold can of pop at our campsite- Takura Holiday Park. And there we stayed, having ice lollies, reading, playing cards seeing in the evening. 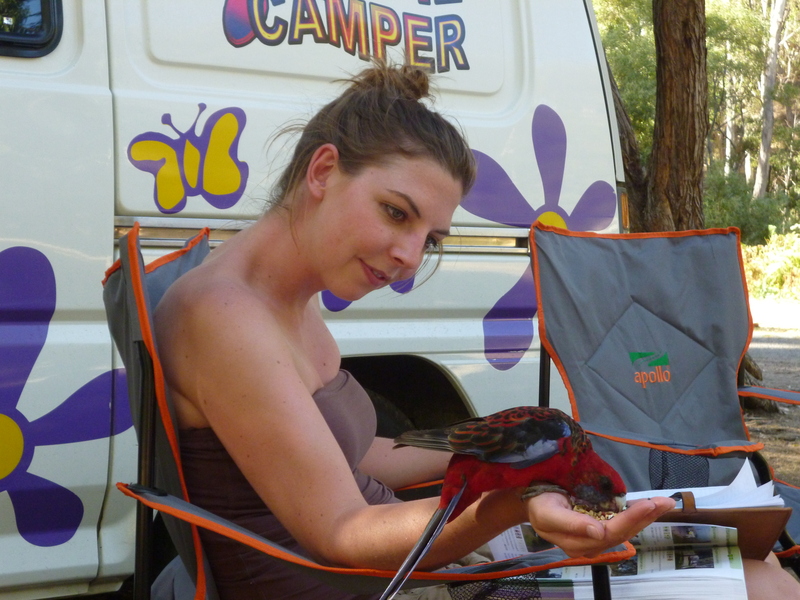 I did have an exciting encounter with a Crimson Rosella though, courtesy of the gentleman from the caravan across from us depositing a load of bird seed in my hand and saying “meet the locals”! All was well until I got swooped by another Crimson Rosella with a gammy eye and then I freaked out and scattered the seed everywhere. I then felt like Mary Poppins until the all the birds, now a party of 4, ate all the seed and flew away! BBQ steak and salad for tea and then the terrible task of trying to get to sleep in a roasting camper van. Open the windows for a chance of a little breeze but the likelihood of being bitten alive by bugs? Or slowly sweat to death in the metal box that was our camper?….decisions, decisions. We opted for the breeze!